I'm no expert on Hawaiian culture although I am quickly approaching my 5 year anniversary of living in the Aloha State. There are many misconceptions about Hawaii that I'm happy to set straight for you. Wedding in Hawaii, real original! All weddings in Hawaii aren't on the beach. Our will be indoors, in a Church, nowhere near the shore. One stereotype, however, is true: that Hawaii loves SPAM! 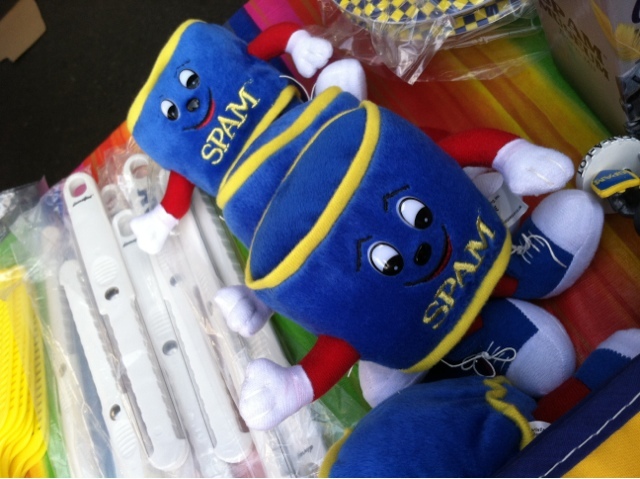 This article gives a great background on why SPAM is so popular in the Aloha State. 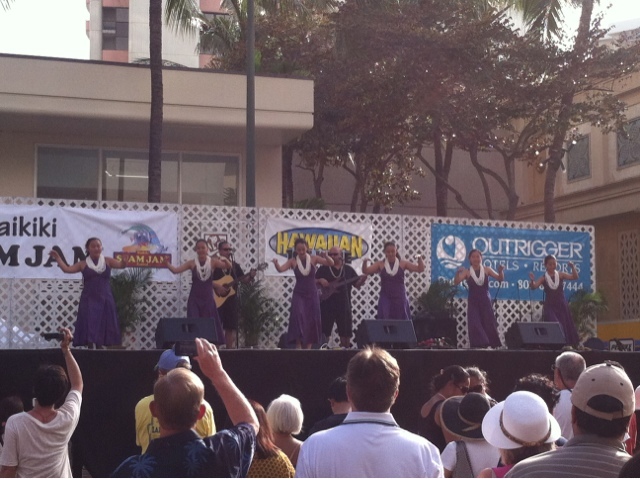 It is so well loved here that there is an annual festival in Waikiki to celebrate! My family and I braved our first SPAM Jam in 2010, although we were just window shopping before going to dinner at Duke's and didn't partake in any of the creative culinary creations. 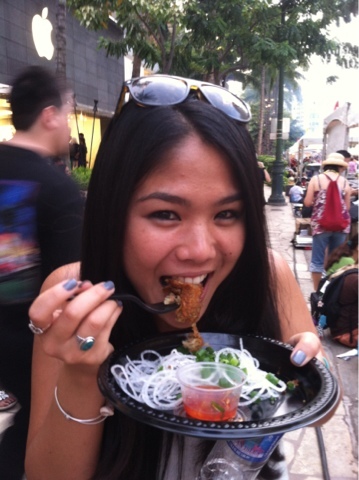 SPAM Jam 2013 was just last weekend and I headed to Waikiki with my appetite in tow! 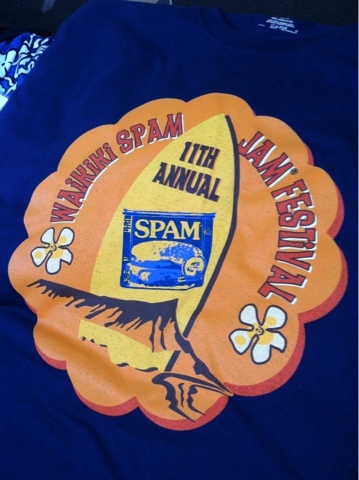 The t-shirt design was adorable and I learned that this years' is the 11th annual SPAM Jam. Per usual there were many inedible SPAM items for sale. The festival shuts down the entire main road in Waikiki, Kalakaua Avenue, and there are 2 stages on either end of the craziness. 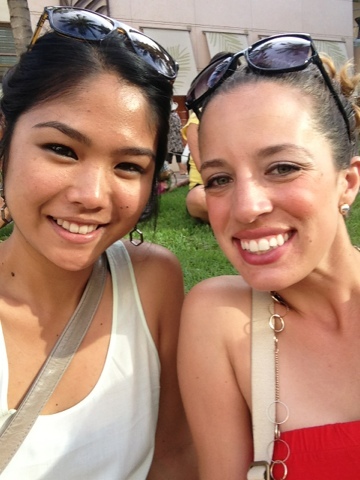 We caught a few moments of this hula show and later saw the fire dancers! I forgot to mention in the misconceptions list above that hula dancers don't wear tacky coconut bras or cellophane, didn't I!? After scanning all of the food booths and securing cash for purchasing, Chaslee and I found a nice spot in the grass to chow down. The Italians would say mangia and in Hawaii it's grind. Regardless of what you call it, it was finally time to eat! 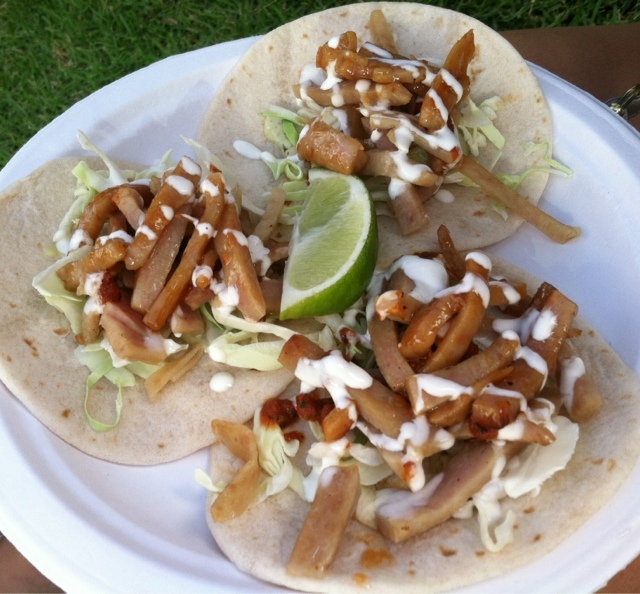 We started with the SPAM street tacos. They were surprisingly delicious and the lime was a great compliment to the salty SPAM. I'd eat them again! 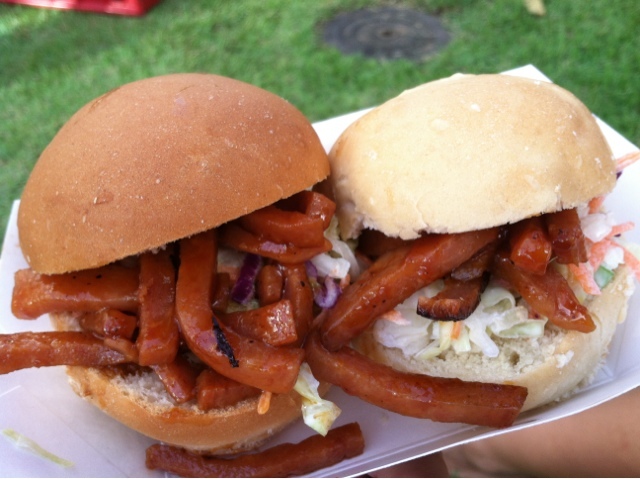 We shared both the tacos and these mango BBQ SPAM sliders which were even better! The crunchy slaw-like base was perfect for the saucy meat and the soft rolls were scrumptious. These are from the same place that's catering our wedding and I'm honestly considering serving them for our reception!!! People want to eat SPAM in Hawaii, right? Eventually Chaslee and I were joined by another friend, Cassie! Confusing right? 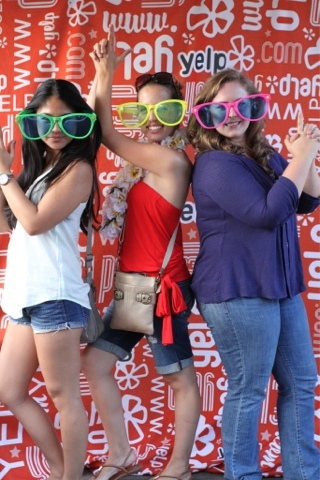 Obviously my friends are totally shy and hate to have fun. 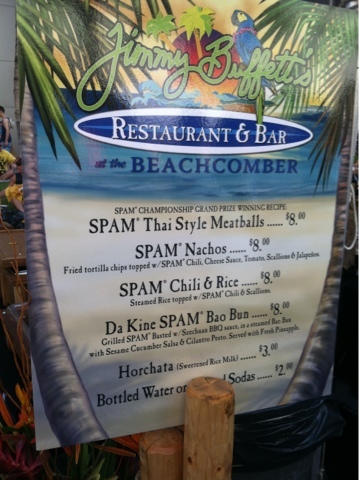 We braved a really, really long line for Jimmy Buffett's to try their "SPAM Championship Grand Prize Winning Recipe: SPAM Thai Style Meatballs." 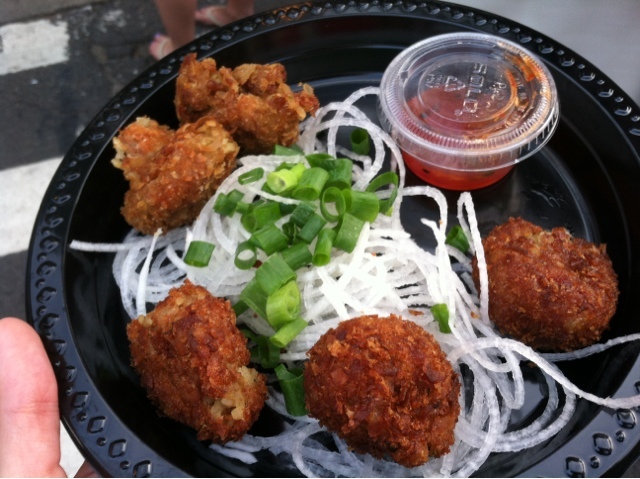 They were more like fritters than meatballs because of the doughy, fried texture and they were the best thing we ate all day! They lived up to the great expectations of their long-winded championship title with their crunchy coconutty goodness. Chaslee grew up on Maui and says her Dad LOVES SPAM. She doesn't seem to hate it, either! Although we were too full and/or cowardly to try it, the most creative dish we saw was the SPAM n' Apple Cobbler - described as freshly made apple cobbler topped with SPAM crisps and caramel sauce and served with a dollop of Ben and Jerry's classic vanilla bean ice cream. Would you try that?! I hope this clears up some of your misconceptions about Hawaii! Until next year, SPAM Jam.